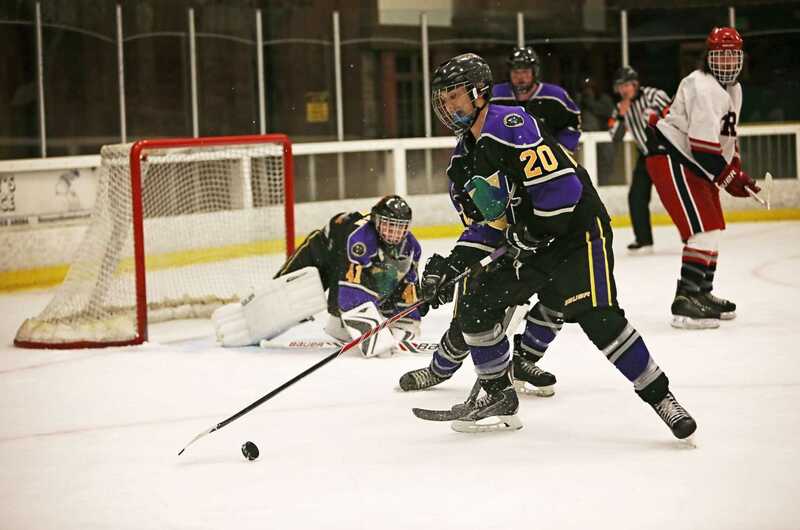 After two weeks of rough defeats and brutal injuries, the SF State hockey club’s season changed from one full of promise, to one full of questions. The team endured back-to-back losses to the SJSU Spartans and Santa Rosa Junior College Polar Bears in blowout fashions, however the team’s 0-2 start is the least of its concerns after losing two players who were carried out by ambulance from both games. The injury bug first struck the Gators Sept. 27 in Fremont when forward Paul Kline suffered a deep slice above his knee cap after a big collision against the Spartans. The team remained in high spirits despite Kline’s injury, however the trend continued Friday night against the two-time reigning Pacific Collegiate Hockey Association champion Polar Bears when an SRJC defender dealt a vicious blow to SF State’s Brian Lu, causing Lu to hit the back of his head against the boards. Teammates rushed to Lu’s aid after he was unable to get up, and called an ambulance to take him to the hospital, marking the second Gator trip to the hospital in two weeks. 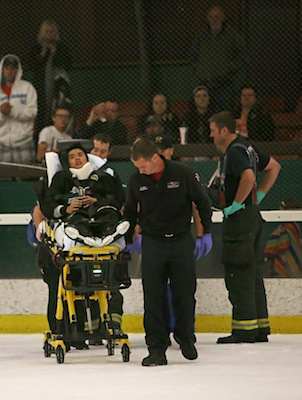 Brian Lu, #15, is led off the ice on a stretcher after he took a hard hit against the Santa Rosa JC Polar Bears at Snoopy’s Home Ice on Friday, Oct. 3, 2014. Sara Gobets / Xpress. The hit came late in the second quarter after the Polar Bears already built an insurmountable lead. Papazian said hockey is inherently physical and dangerous, but the hit that lead to the injury at that point in the game was excessive and unnecessary. Kline, the safety officer for the Gators, was frustrated as he stood helplessly above his fallen teammate while waiting for the ambulance. He said if the team could, they would have a trainer to tend to the players when things like this happen. The disgruntled Gators hung around the locker rooms briefly after its 18-0 defeat to the Polar Bears to discuss whether or not to cancel the upcoming practice. With a diminished squad, the team will take advantage of its next two weeks to recover and prepare for a rematch against SJSU. After facing some of the best teams in the PCHA, Papazian said the experience will help the team shape up its offense and improve as a cohesive unit. The Gator’s next match takes place Oct. 24 at the Nazareth Ice Center in Oakland, for the team’s first home game of the season. Despite losing by double digits to the Spartans in the season opener, Papazian expects his team to bounce back.